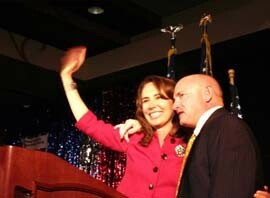 Rep. Gabrielle Giffords will attend husband Mark Kelly’s space shuttle launch in Florida on Friday. In an interview in Houston with CBS’ Katie Couric, Kelly says the Arizona congresswoman’s doctors in Houston have cleared her to fly to Cape Canaveral, Fla., for the launch of Endeavor. Kelly is the commander of the shuttle mission. CBS released excerpts Sunday of the interview scheduled to air Monday on the "CBS Evening News with Katie Couric." President Barack Obama and his family also are scheduled to watch the launch, although it’s unclear if they’ll watch it with Giffords. It’ll be the first time Giffords has traveled since she was flown to Houston from Tucson, Ariz., on Jan. 21 for rehab after she was shot in the head Jan. 8. Six others were killed.